Is there an SSL / TLS Certificate state-cache on Windows, IE, and Outlook and how it it managed? I can only assume a SSL cache exists in Windows, Outlook, or in it's IE dependency. 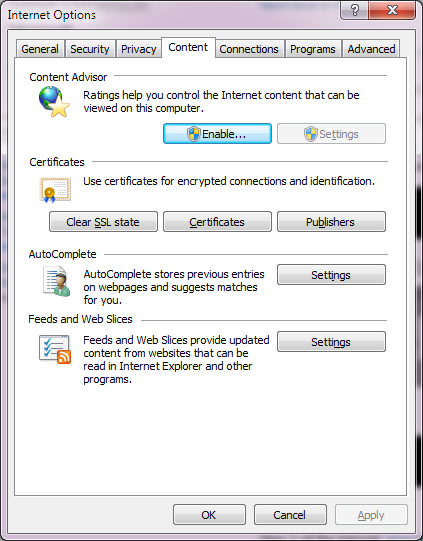 What SSL data exists in the IE SSL state button? Is this a cache of web HTTP data, or certificate data? How do I edit or manage this cache? The 'Clear SSL State' button is there to purge the SSL cache of selected Client Certificates used for authenticating to SSL-based services. It's just there to make client-certificates work faster (partly by remembering which certificate you used to authenticate to a certain site). It doesn't cache previously seen SSL certificates. 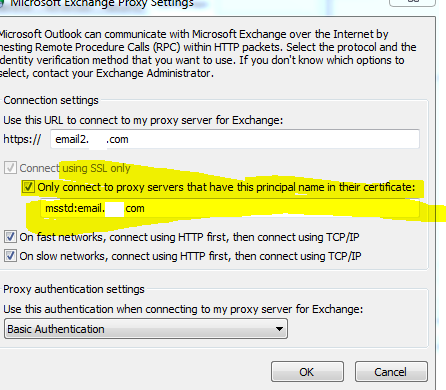 Outlook+Exchange can use Client Certificates for authentication, but it's not a common configuration; most sites stick with NTLM or Kerberos over SSL. Outlook+IMAP can't use client-certificates, but I may very well be wrong; I haven't heard of an instance where they're used. What you may be running into instead is problems with the Windows SSL Validator. Normally, SSL management is per process. The SSL implementation DLL will, for instance, remember SSL sessions and be able to negotiate abbreviated handshakes (that's when a client reconnects to a server, and they agree to reuse the symmetric shared secret they established in a previous connection). Internet Explorer now has the habit of spawning several process, but includes some tricks to share the SSL session information across these process. This all disappears when all IE process are closed, though. What remain in cache are the CRL. When Windows wants to validate a certificate (e.g. a server certificate), it will try to obtain revocation information, thus CRL or OCSP responses, downloaded from URL which are found in the certificates themselves. Windows will cache the CRL, and that's an on-disk cache because it resists reboots. Windows will also cache "negative" CRL, i.e. failures to obtain a CRL from a given URL. If Windows could not obtain a CRL from a specific URL, it may abstain from trying again the same URL for as long as eight hours -- and even a reboot might not suffice to unlock it. This is often irksome. Similarly to the CRL cache, Windows may also download intermediate CA certificates, using URL from the certificates (the Authority Information Access extension). These CA certificates can be cached, too, although they do not necessarily appear in the certificate stores (as visible from certmgr.msc). See this blog post for some information on the Windows CRL cache. The SSL client validates the SSL server certificate. The SSL server validates the AD server certificate. The AD server validates the SSL client certificate. All three validations being performed on distinct machines, with subtly distinct rules, and the mapping of certificates onto AD accounts can fail in many ways. Not the answer you're looking for? Browse other questions tagged tls windows certificates exchange internet-explorer or ask your own question. How much of a certificate is actually covered by the CA's signature? Does subject alternative name order matter for TLS certificates?